FOOD MATCH: This light-style, tart and crisp Pinot will fare well with a broad variety of food. Red meats, grilled poultry, salmon or mushrooms just begin to tell the tale. It was excellent with a pasta dinner, spaghetti in an umami-rich sauce of tomatoes, onions, garlic and reconstituted dried porcini. WHEN TO DRINK: Pinot can be tricky in the cellar, and lower-end models generally aren’t recommended for very long aging. Still, with good balance and quality and a sturdy modern metal screwcap to protect it, this Argyle should be safe, and may evolve, over five years or so after the vintage. VALUE: My local price looks pretty good next to the $27 retail that the winery charges online. Wine-Searcher.com calculates a $23 average U.S. retail, but check around, as some merchants report in as low as $15. This page offers a brief description and online sales for Argyle 1913 Willamette Valley Pinot Noir. For information on the winery and its other wines, use this link to back out to the winery main page. 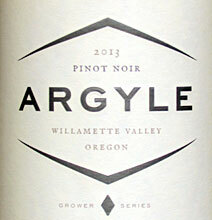 Check prices and find vendors for Argyle Willamette Valley Pinot Noir on Wine-Searcher.com. Argyle Winery also offers online sales at this link, but take note that pricing appears to be set high, likely to avoid irritating local retailers by under-selling them. « Wine list is meh? Have a cocktail!